James: On the face of it colonising Venus appears ridiculous. With temperatures of over 500 degrees celsius and atmospheric pressure 90 times that of earth how is it even possible to get started on a colonisation mission? Gavin: All target locations for colonisation in our solar system are going to have extremes of temperature. However, it's certainly true that Venus is leaning towards the hot side, and heat can be harder to deal with in terms of finding appropriate materials which can withstand the temperatures. In addition, heating things is almost always simpler than cooling them. While all this is a problem, it turns out that at about 50km above the surface of Venus things look a lot nicer. At this altitude temperature is between 0 and 50° C which is very earth-like indeed (although I once was in the Negev when it was 50° C and can't say I was very comfortable). In addition the atmospheric pressure is about 1 bar, roughly equivalent to Earth's atmospheric pressure at sea level. In order to go to Venus then, we'd likely need to stay in the atmosphere. This would require developing appropriate dirigible technologies, something which hasn't been looked at extensively in terms of planetary exploration. Since we've sent few probes to Venus we'd obviously have to do a bit more of that before we thought of colonisation, but it should be within the realm of current technology to do so. Eventually for colonisation we'd be looking at making floating cities. Creating such a thing on Venus turns out to be a lot more feasible on Earth. Breathable air for instance can be used as a lifting gas on Venus where it's comparable to Helium is on Earth, having about 60% of the lift. Though breathable air itself would probably be insufficient to lift an aerostat, it could be assisted by some other gas such as Helium, which on Venus would have tremendous lifting potential indeed. Okay but floating cities seems like an extravagant way to colonise another planet. Wouldn't settling on Mars make more sense as a first landing point beyond the Earth-Moon system? Mars is not really a great destination for a lot of reasons. It's quite small, having only about .38g of gravity which is likely to lead to all sorts of problems including bone decalcification and muscle atrophy. This would also make return from Mars to Earth very difficult after sustained periods on Mars. By contrast Venus is around .9g, at the surface, and only marginally less at 50km. Mars is extremely cold with temperature bands in the range of -17.2° C to -107° C, nothing even close to the Earth like temperatures in Venus's upper atmosphere. It has very little atmosphere, meaning that distilling appropriate gases for breathing will be difficult. This also means that it is much less protected from radiation and asteroid collision. To top it off, it's hard to get to Mars and has less frequent launch windows, 584 days for Venus and 780 days for Mars. That's a pretty significant shift in the frequency with which supplies can be sent. How likely is the retrograde orbit and lengthy days – a day = a year on Venus likely to impact on the colonists? Venus is very peculiar in rotating the "wrong" way as compared with the other planets. This is possibly due to some massive collision in its past. In addition to this retrograde orbit it also rotates on its axis tremendously slowly. As you point out, it takes about 243 Earth days to rotate on axis, and 224 Earth days to orbit the sun making its day approximately the same as its year. Humans are certainly very sensitive to circadian rhythm and indeed, enduring 240 Earth days of darkness would probably have substantial negative impact. While this is true, it turns out that this peculiar retrograde orbit has conspired to produce very steady and regular winds that circulate quickly around the planet. At cloud top this wind speed is about 300km/h circulating around the planet once every 4 or 5 earth days. A colony would presumably use this planetary wind to tune its day to something more appropriate for humans by circulating around with the winds. Supplies. How the hell are people going to grow enough food to survive in the long term on Venus. Growing food requires primarily CO2, Water, Nitrogen, Phosphorus, Potassium, but also Calcium, Magnesium and Sulfur in smaller quantities and Iron, Manganese, Zinc, Boron, Copper and Molybdenum in very small amounts. CO2 is tremendously ubiquitous in the atmosphere, comprising 96.5%. Clearly there is no problem getting things for plants to breath. Water, weighing in at just 20 ppm is a much bigger problem. It seems like that water would need to be imported. This might not be a show-stopper however as a carefully controlled closed cycle habitation might not lose much in the way of water. Nitrogen is about 3.5% of the atmosphere, so less of a problem. Phosphorus and Potassium may exist in some concentrations on the surface, but then we have the whole problem of tremendous pressures and temperatures and how things could possibly be mined under such conditions. It may turn out that we have to be careful about reclamation of all waste products, and to continue to import these goods from Earth, or asteroids. And energy. What sort of engine will need to be developed to get the colonists to Venus and to provide enough power when they arrive there. 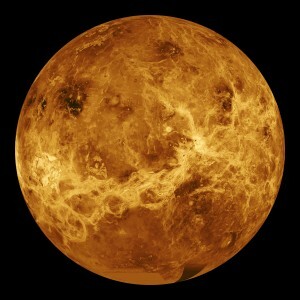 Solar power is going to be a useful power source on Venus. The solar flux goes like an inverse square in the distance from the sun (you can imagine that the light has to be evenly distributed on a sphere whose size is growing as you get further away from the sun – the surface of a sphere has an area of 4πr²) so it turns out that the flux on Venus is about twice what it is on Earth. If there is a need for more power, perhaps for propulsion, that might be achieved with small nuclear devices, as uranium has a tremendous energy density and would require less importation and servicing. It may also be possible to exploit heat differentials between the surface and upper atmosphere using some sort of convection plume with turbine. Similar technologies have been explored for use in the Australian desert. What sort of time frame is involved in planning and getting the first colonists settled? Certainly we need to send a lot of probe aerostats first. There are certain to be problems with the technologies that can only really be delved into by trial and error. We will need to develop fabrics suitable for the relatively high levels of sulfuric acid that forms in the atmosphere and we will need deployment methods for aerostats. Since Mars isn't terribly kind to aerostats, having a wispy thin atmosphere, very little research has gone into such things. Such a project is probably 10 years at least and we wouldn't be ready to really start progressing a human exploration project for another 20 years probably. So I'd say we could be exploring Venus with humans in about 30 years and looking to colonise some time after that. Perhaps 50 years would be an optimistic estimate provided the will was there. Who will fund such expeditions? In times past colonists left for new worlds due to religious persecution or just simple poverty. What motivations will people in the near future have for leaving a habitable planet for an inhabitable one? Humans strive to learn explore and colonise. This can be a progressive or regressive aspect of humanity. In the present period, when looking to explore other planets I think it would be a progressive thing. It would help to place humanity in appropriate context, as a very small and fragile thing in a very large universe, but with tremendous potential. In the current climate of a fragmented world fighting over resources for no apparent reason, and incapable of dealing with some rather simpler environmental difficulties, it doesn't seem too likely that we will take part in such an endeavor soon. Perhaps that's the kind of thing we need though to get people to stop looking so much at our differences an to start focusing on our commonalities and our cooperative potential. What sort of critical mass of people is necessary to make it a viable society in its own right? That's a very good question. From recent genetic research it seems likely that we have in our past had a bottle-neck of population that was very small, perhaps as small as twenty thousand. In order to have a reasonably viable colony you'd probably want to shoot a bit higher than such a number which was probably caused by some disaster event. I'd say 100k would be on the inside for a truly viable self sustaining population. Is there not a significant possibility that living in such a hostile environment will necessarily give rise to an authoritarian social structure simply in order to survive? I think it can really go both ways. If you look at primitive hunter gatherer societies you can sometimes see absurd authoritarianism or very peaceful cooperative societies. The Inuit really lived on the edge of existence, and while leading a fairly brutal existence, weren't particularly authoritarian. Authoritarianism really requires a lot of energy on its own and isn't really a good response to stress, except perhaps locally to the strongest individuals who can cannibalise the rest. There is also far less to gain in a society with no surplus, from becoming the head-honcho. I suppose then my answer to the question is, no I don't think it is inevitable, but yes, I definitely think it is possible. Even if you have floating cities isn't there a significant possibility that they will be claustrophobic for much of the population? This could prove to be a real problem. I mentioned the Inuit previously. In the Last Kings of Thule, the author details how common a problem is "cabin fever" from having been living in a dug-out hole in the ground while it was too cold outside to leave for long periods of time. Having very sunny open sky plans and large multi-part and separate "cities" with frequent human circulation will probably be necessary. If it's green enough and spacious enough, perhaps humans will be able to adapt comfortably enough. It's certain to be better than a hole in the ground. By the time we are technologically capable of settling on Venus won't we, presuming we're still around as a species, have reached a stage on Earth where we have figured out how to live sustainably on the home planet? Sustainability on Earth should definitely be a priority. However, there are big advantages to working on such a project. Learning about closed cycle human habitation incorporating extensive waste reclaimation and agriculture has tremendous potential benefits on our understanding of how the Earth works, and how we might deal with our problems here. It can teach us how to be more sustainable on Earth and more about what sustainability means. Colonisation of other planets should be seen less as an abandonment of earth and more as an insurance policy against catastrophes which it might not be possible to avoid (like a comet hitting earth) and just for the sake of exploration. What role, if any, do you see the development of Artificial Intelligence over the next 100 years playing in the expansion of life outside of Earth? Will it render human led exploration redundant? Human lead exploration is almost certainly already redundant from a scientific point of view. We sent humans to the moon and they played golf. We put scientists up in the space shuttle and they grow chickens. It's really completely unnecessary to send people up in space at all unless you are interested in how to send people into space. That said, I think AI has big potential for improving space exploration. Because the distances are so great, it's very difficult to control robots from remote on another planet. While hard on Mars it would be absurd for the moons of Saturn. That means greater autonomy is going to be needed. When it comes to imagining how we might one day mine the surface of Venus, one would think that such a thing would almost certainly need be done by robots. Humans have to take entirely too much of their environment around with them to be suitable in radically different environments. Robots can be purpose made for those environments. I think we need to focus a lot more on robotic exploration for the present and near term exploration and completely junk projects like the Space station and Space Shuttle. Those projects are not helpful in learning about how to get to other planets with humans and they are a big money sink. The amount of exploration that could be done with that money would have been phenomenal. To get a quick contrast, estimated costs for the shuttle come in at $1.3 billion per launch, essentially to put some humans in low earth orbit for a while. The Mars pathfinder's entire mission was only $280 million including all of the necessary research and development for the project. If we want to colonise Venus we first have to learn about it, and then we have to learn to get humans there. Our current programmes don't do either. This entry was posted in Sci-tech. Bookmark the permalink. Interesting post. I must admit I think it will make more sense to send people to Venus when we’ve sent people to the gobi, if you see what I mean. It’s hard to conceive what purpose it otherwise has. Sure, insurance against a planetary catastrophe, but the programmes to control potential asteroids that could hit Earth are incredibly underfunded and much more clearly useful as insurance, so I’m not sure if, at this time, we have enough of a collective self preservation drive as a species. I’m reminded of a very good post on the notion of space colonisation–as opposed to exploration–by Charles Stross, which got libertarian capitalists raging: The High Frontier, Redux.